Sometimes I just feel like something a little sweet for dinner...which was the case tonight. I could have gone with the usual pancakes with fruit, or belgian waffles, but I decided I wanted something a bit on the lighter side, but with plenty of creamy filling. Crepes came to mind...the wonderful little french creations with endless filling possibilities. I wanted to go the non traditional route however, so I decided on corn crepes instead of the usual flour. I used a mixture of corn flour and corn meal, so that the batter would remain light. Tonight I decided that a bit of chevre filling would be nice in the crepes...so I guess these are similar to blintzes in that sense. I spiked the chevre with a bit of honey and lime since lime loves corn. 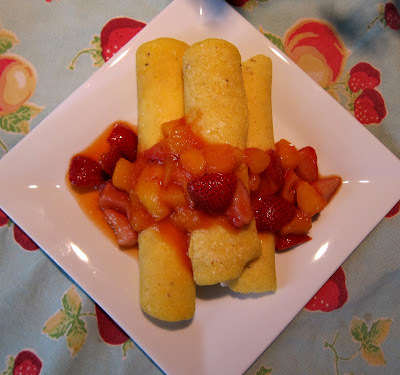 Not being one to leave fruits or vegetables out of any meal...I had to make a fruit compote that complimented the crepes...and strawberries and mango seemed like a wise choice. Since the fruit was perfectly ripe, it hardly needed to be sweeened, so I simply added a touch of honey, and some lemon juice to keep the flavor bright. They were wonderful...the creamy tangy chevre married well with the sweetness of the corn in the crepes and fruits...heavenly! Try these if you feel like a treat for dinner...and you won't need any dessert! To make sauce, combine all ingredients in a small saucepan and cook over medium heat for about 10 minutes until fruit is just starting to soften. Remove from heat. To make filling, combine all ingredients in a bowl and mix well until completely blended, then set aside in the fridge. To make crepes, combine all batter ingredients in a food processor, and process until smooth. Let rest 15 minutes. Heat a non-stick 8 inch pan over medium heat and melt a small amount of butter in it (or use non-stick spray if you are not a butter fan). When hot, add about 1/4 cup batter and swirl to spread out batter a little. Let cook until the surface is dry, then loosen edges with a spatula and carefully flip to the other side, and cook 30 seconds more. Place on a plate. Repeat with remaining batter using more butter or spray if necessary and stack crepes on the plate. To assemble, place about 2 Tbsp of the chevre filling on each crepe in a line down the center, then roll up. Repeat with remaining crepes, and place 3 on a plate spooning the fruit compote over. Nice recipe! 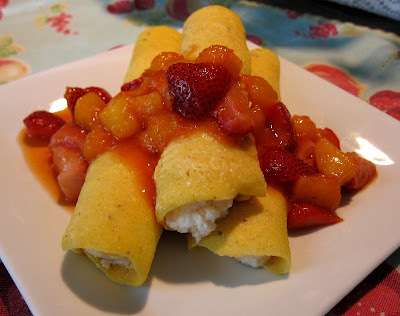 great idea using corn flour and corn meal for crepes! Oh that is a most excellent idea for crepes! I love cornmeal :) Thanks for sharing. These looks delicious, I like all your ingredients, what a nice dish to enjoy for dinner!